Emily Johnson sheds tears in front of the headstone for her older brother, Army 1st Lt. David Andrew Johnson, who was killed by an improvised explosive device in 2012. 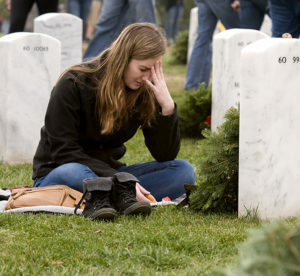 Johnson and other family members of fallen troops as well as thousands of volunteers were at the Arlington National Cemetery, Va., on Dec. 12, 2015, for Wreaths Across America Day, an event to honor veterans during the holidays. “I heard it on the news that morning and I just knew he was on there,” she said of her son, TSgt. Daniel Lee Zerbe. Hours later, her premonition came true when military officers knocked on the door to inform her that Daniel was on that helicopter, as he and others traveled to help Army Rangers in a fierce battle against insurgents. 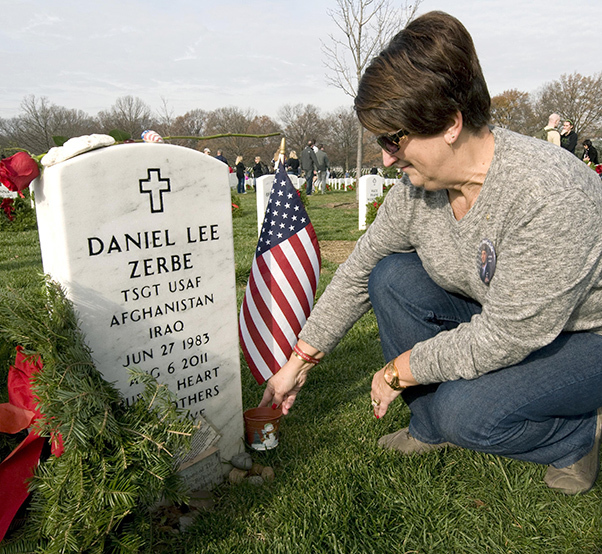 Zerbe and her family laid a wreath on Daniel’s headstone Dec. 12 during Wreaths Across America Day at Arlington National Cemetery. The event drew roughly 50,000 family members of fallen troops and volunteers who placed more than 240,000 wreaths on the white marble headstones that line the cemetery to symbolize their respect for those who gave all. But the wreaths, which were also placed at more than 1,000 locations across the country, were not just for decoration. Susan Zerbe prepares to place a wreath on the headstone for her son, Tech. Sgt. Daniel Lee Zerbe, who was one of 30 U.S. troops killed when a CH-47 Chinook helicopter was shot down in Afghanistan in 2011. Susan and other family members of fallen troops as well as thousands of volunteers were at the Arlington National Cemetery, Va., on Dec. 12, 2015, for Wreaths Across America Day, an event to honor veterans during the holidays. Emily Johnson traveled from Wisconsin to rekindle memories of her older brother, Army 1st Lt. David Andrew Johnson, who was killed by an improvised explosive device while on a dismounted patrol in Afghanistan in 2012. Nearby, Bob and Pat O’Kane-Trombley recalled memories of their son, Capt. Thomas Gramith, an F-15E Strike Eagle weapons systems officer who died along with the pilot when their aircraft crashed in Afghanistan. They said he was “everybody’s big brother” who had a selfless, humble attitude that even earned him a humanitarian of the year award at Seymour Air Force Base, N.C.
“He really did a lot of community service that others noted, but he never talked about it,” Bob said. 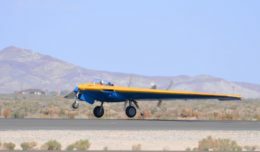 The loss of Thomas in 2009 hit the family hard, they said, especially since the 27-year-old airman had 9-month-old twin daughters at the time. “We got the knock on the front door and the minute I looked out of a small window on the door, I could see the gleaming silver cross,” Pat said of the insignia of the chaplain who would tell them the tragic news. “That was the day when everything came crashing down,” Bob added. Thomas and his pilot, Capt. Mark R. McDowell, 26, were only two young men of countless others who died defending the country. None of them should ever be forgotten, Bob said. Family members of Army Sgt. 1st Class Johnathan McCain, who was killed in Afghanistan in 2011, spend time at his headstone at Arlington National Cemetery, Va., on Dec. 12, 2015. Families of fallen troops and thousands of volunteers were at the cemetery for Wreaths Across America Day, an event to honor veterans during the holidays. To honor the fallen, fundraising efforts amassed about 910,000 wreaths that were placed on headstones across the country on Dec. 12. One of the largest fundraising groups was the Civil Air Patrol, which helped bring in about one-third of the wreaths. The annual event started in 1992 with 5,000 wreaths. 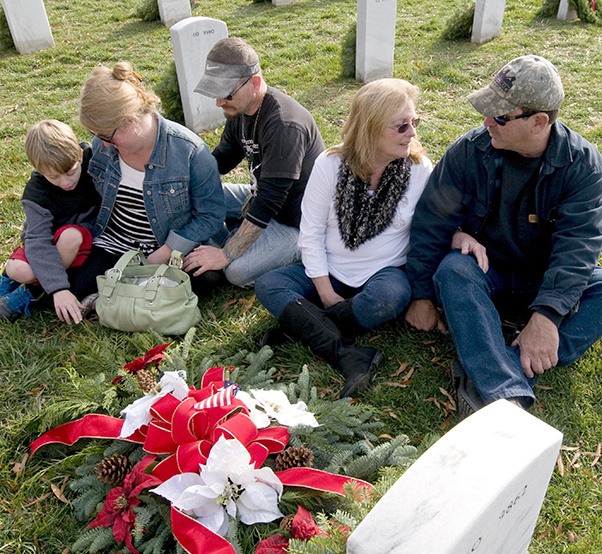 For the first time last year, volunteers had enough wreaths for every headstone at Arlington. “We did this and then the American people with their American spirit got under us and lifted us up,” Worcester said. But placing wreaths was just one mission that volunteers were asked to do when recognizing those buried in Arlington.